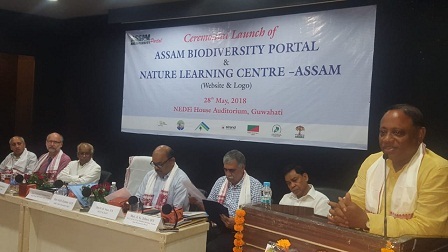 The Assam State Biodiversity Board in a function organized at NEDFi House Auditorium on Monday ceremonially launched Assam biodiversity portal and the logo and website of the Nature Learning Centre (NLC-Assam). Suklabaidya in his speech elaborated the significance of biodiversity in everyday life. He said mankind, being the superior most creatures on this Earth, has an inherent responsibility to conserve biodiversity. He said all have a duty to make the earth better for future generations. Emphasizing the need for information and awareness on the diversity of life forms on this planet he said that the Assam Biodiversity Portal would act like a ‘hub’ and the ‘mother of information’. He appealed to the delegates to make the portal rich by contributing quality information. The forest minister welcomed the initiative of Nature Learning Centre-Assam and desired that this Centre should extend its reach to schools and colleges of remote areas across the State. Additional Chief Secretary, Environment & Forest Alok Kumar emphasised the need for active use of the portal by the students, researchers and academicians. PCCF Assam N K Vasu in his welcome address also spoke about the dynamism and utility of biodiversity portal. He congratulated the Biodiversity Board for the initiative. Academicians, researchers and students from various universities and colleges from across the state, experts and contributors of the portal, eminent biologist Dr P C Bhattacharjee, Director of the French Institute of Pondicherry Frederic Landy, PCCF (Wildlife) D P Bankhwal and senior officers from forest department and Biodiversity Board attended the programme.